They say the people make the place and this collection of short stories about unique characters in a small town setting captures the truth of that adage. After uprooting from an urban lifestyle in the Pacific Northwest to resettle in the rural Appalachian Southeast, I met my first unique small town character. Then another, and another. Down at the recycling center, Fuzz always had a story. On the town square, Phil seemed eternally perched in a rocking chair outside the coffee shop, just waiting for a willing ear. Meanwhile at the bookstore, news flashes from the community’s latest event were recounted with enthusiasm and maybe even a little exaggeration. It wasn’t long before I realized how ripe these chance meetings were. Stories told by the real-life characters in my new home ranged from folklore to rants and raves. But even more than the charming accents with which these stories were told, the storytellers themselves captured my attention. What made them tick? In the privacy of their homes or after the last customer of the day had gone, what deeper stories were waiting to be told? The more I imagined what their lives might be like, the more compassion and intrigue I found for the individuals who stood out in my small town. Using their stories as a guide, I set out to write one of my own. Then another, and another. When I was invited to edit the 2009 themed fiction anthology for Main Street Rag, I didn’t hesitate to suggest this theme. 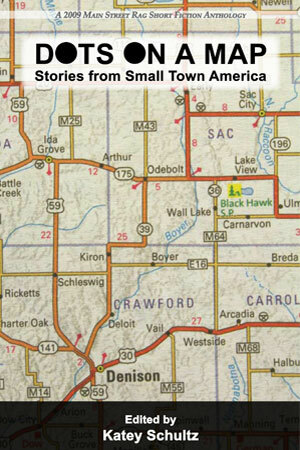 The 23 stories collected here conjure a mosaic of personalities as diverse as the imaginary towns from which they stem. Although created from scratch, chances are at least one of these characters will remind of you of someone you knew once upon a time in that little dot-on-a-map town, from way back when. Be the first to review “Dots On A Map (Stories From Small Town America)” Click here to cancel reply.